Every day when dad gets his mail he calls one of us: me, Paula or Aimie. Sometimes he calls each of us, one after another. If there is ANY mail related to mom or Aunt Julie he calls me. If there is ANY mail related to Haley’s school he calls Paula. If there is ANY mail related to the comcast bill or the trash bill (that Aimie helped with) he calls Aimie. Last week he called and said that the mail man did not bring his SALE ADS (the grocery store coupon flyer that comes every week) so he went to the post office to complain. Then he went to the grocery store to walk up and down the aisles to see what was actually on sale. He’s very disappointed in the US Postal Service, whether they bring him his mail or not. So today when I asked him if he’d take a box to the Post Office for me, and he said, “Well I can’t because I’m carrying my gun….” that was probably a wise decision. This envelope was on the counter at dads house, it was in the ‘I think it’s trash but will let Kim throw it away’ pile. He doesn’t trust his discernment of junk mail yet. “Well I’m not going to be able to send them any money, so I didn’t think it was fair to take their labels.” Very honest of him. But the labels were there and were either going to be used or thrown away. It took a bit, but I convinced him to use the address labels. 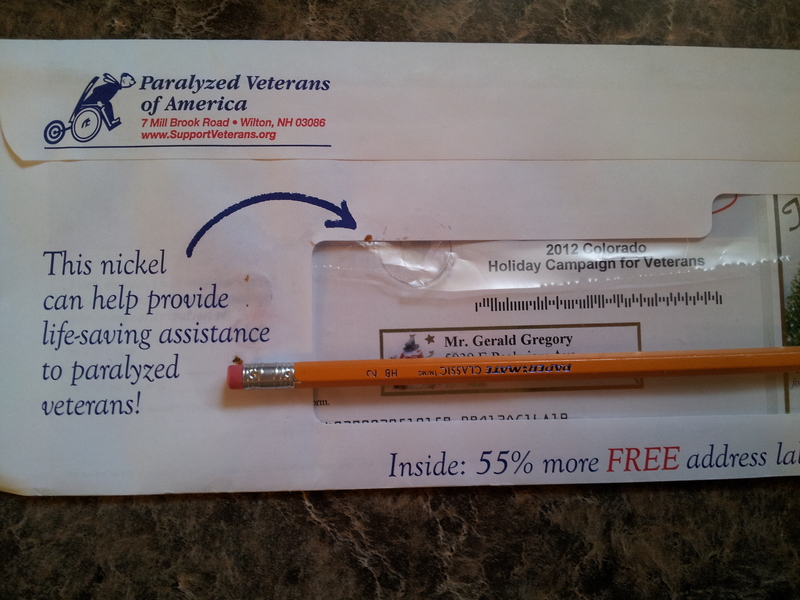 When I opened the envelope, I noticed the “This nickel ….” arrow, but didn’t find the nickel. Also noticed there was a small hole in the plastic covering the spot. “Dad, there was no nickel…” I wondered. “Oh, I took that already.” Mr. Fair thought it okay to take their nickel….just not their labels. ?? Dad doesn’t enjoy talking about politics as much as mom did…maybe no one enjoys talking about politics as much as mom did! But dad has always had an opinion, and has always voted. This election has been bitter-sweet for so many reasons. We’ve gathered to watch debates as a family, without hearing mom scream at the TV; we’ve followed poll numbers without being able to call mom and discuss every change with her; we’ve involved dad in our political discussions (at times to our great frustration). Dad is very hard of hearing – have I mentioned that – and I’m not sure if that is the reason for his frequent mispronunciation of words…but he calls Romney “Rom-I-ney” (sounds like hominy). Every time he says it I smile. And every time he calls me with a new poll number, and his interpretation of that poll, I try to smile. Because I’m not sure he is reading the polls correctly, or relaying the information correctly…and I can’t continue to get worked up with him on a daily basis regarding the volatility of the polls. For some reason it’s just not as fun as it was with mom. 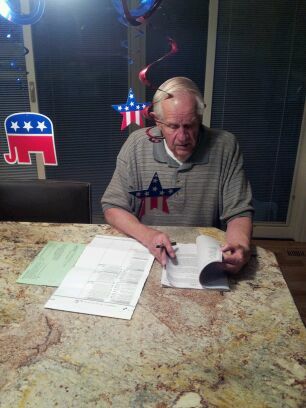 When dad received his mail-in-ballot, he brought it to my house and voted. He read the accompanying booklet that is designed to explain the amendments, he took his time, he was an informed voter…And cast his vote for ROM.I.NEY. Went to dad’s house yesterday to take him some leftovers from lunch. Sometimes he won’t go out to eat with us when we invite him because he’s too tired, or needs to get on his oxygen…so we bring him our leftovers. When we arrived I noticed that he’d gone to the grocery store and had put about 8 boxes of Macaroni and Cheese and 10 boxes of Pasta in the upper cabinet, where mom never put food. I asked why he put them there, and why he bought so many! I then showed him where the boxed dinners and the other 15 boxes of noodles and Mac ‘n Cheese were located. Sadly, he can’t bend over and get into the cabinet where they’re kept. I should have realized that! Because that’s also why he leaves his oatmeal box and oatmeal pot on the stove. He can’t bend over and retrieve those from the lower cabinet either. The kitchen looks exactly as it did when mom was here. But why? Because we keep putting everything back to where she had it? She doesn’t really care what her kitchen looks like anymore. And, it’s dad’s kitchen now. So Katie and I moved the plethora of noodles and boxed dinners up into the cabinet that he can reach. We cleaned out two cabinets for him, and let him tell us where to move things. It felt odd, but like the right thing to do. I cried all the way home. Why did moving a bunch of noodles seem so sad to me? Dad is old. Mom is gone. He needs us to move noodles when necessary. Not all things that dad does are crazy or annoying. Friday he came over to my house and I was outside doing some yard work. He jumped right in and helped. 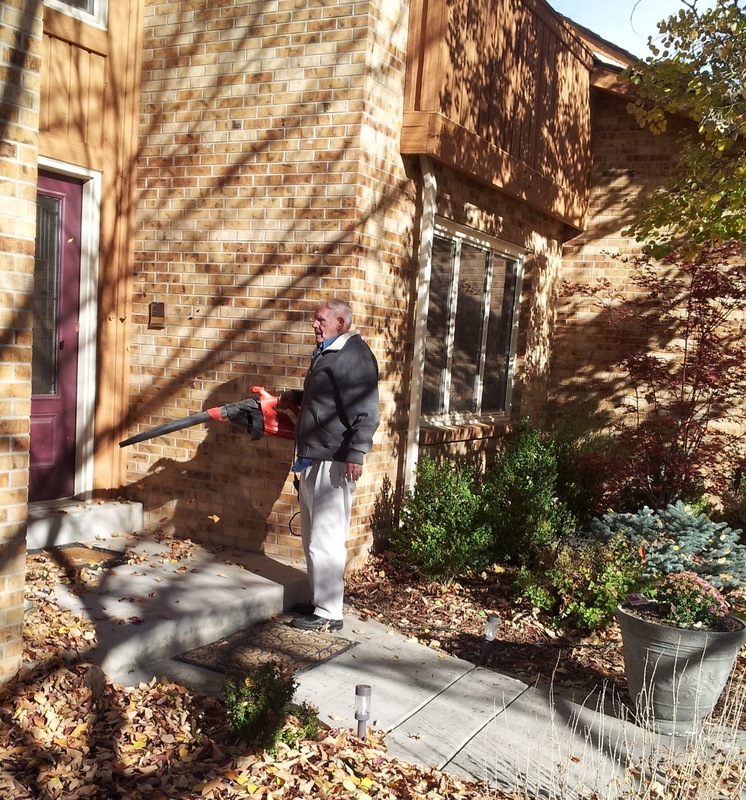 He blew leaves, he raked leaves and helped bag them up, he tried to help me set up my sprinkler (that had already been blown out for the season) to water the new sod that was put in the backyard. “Dad, I need to turn on just station #4, that’s the station that waters the back yard where the new sod is…can you tell me if it is going on?” I asked him. “No I don’t, I have 6 stations total, and #4 and #5 are the back yard stations…I just need you to make sure that the sod is being watered. I’ll turn it on, can you just go to the back yard and call me when it goes on?” I guess I could have run back and forth to see if it was turning on, for some reason thought it would be easier to have him stand there and call me. “Well why would you turn on four stations in the backyard? I don’t understand.” Clearly he didn’t. To make matters worse, there seems to be a problem with the sprinkler controller…no matter what station I turned on, only the front yard sprinklers came on. So that confused him even more. After a good five minutes of him trying to understand the stations of our sprinkler system, I finally turned station #4 on manually, and convinced him that we’d get the problem fixed later. I try not to get frustrated. I know he’s trying to help. I know that this is coming from a good place, and he wants to feel useful. When did he get so old? Is it worse now that mom is gone? He really is a generous man. I know he would do anything in his power to help any of us and I do appreciate him. Every crazy moment of him. I tried to mediate, telling her that we just needed to understand where to get the glasses that the Medicare Advantage plan would pay for; if they didn’t accept it, tell us where to go. She told us there were a few frames that would be free, but no upgrades, no tinted lenses, no designer frames….we didn’t care. She showed us 3 different frames to choose from: one pictured above. Thank God dad loved the pair she showed us (even though he looks scared in the picture) and chose them readily. Maybe dad’s just a grumpy old man. Maybe it was hard to be in the store that he and mom were in together last time. 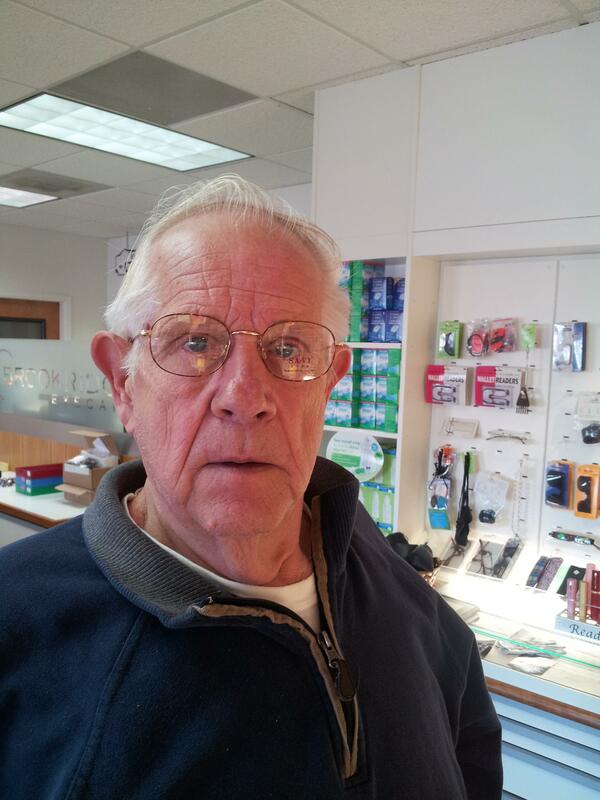 So today when dad told them…”I won’t spend that again!” Maybe he was reacting to moms purchase years ago. 🙂 He showed them. Took dad to the eye doctor this morning. He’s been complaining that the cataract he was diagnosed with 10 years ago is starting to bother him. While in the waiting room, I filled out his Medical History Form. I knew most of the history, but had a few questions. Though the waiting room is very large, and the groups of chairs are spaced rather far apart…I believe the elderly gentleman sitting 25 feet away, heard me. He looked up at me and started laughing. Then dad yelled, “Well tell me this; what exactly IS high cholesterol? Because they never tell me a number, and they won’t say anything but that it’s a little high? So is that a diagnosis of HIGH Cholesterol…or isn’t it?” He ended with a chuckle, the one that says ‘Ya, I’ve got their number’, always the conspiracy theorist. “You eat a lot of beef? !” yelled the elderly gentleman from across the room. “Chicken, you need to eat chicken!” Then he laughed again. Is he also aware of the cholesterol scam? “They did a study on Eskimos, they don’t eat beef. They eat a lot of fish though, and they all have heart problems now. The fish will give you heart problems! Too much fish is a problem…too much beef too.” The volume of his voice as loud as dads, the entire waiting room listening. As they continue to yell back and forth about food and cholesterol and recipes, I checked the NO box next to high cholesterol and continued to listen to them yell back and forth about their diets. “Ya, they’ll tell you anything!” yelled the man across the room, starting to get more angry at whoever “THEY” are. “Why does an eye doctor care about what I eat anyway?” Now the eye doctor is in on it.